Visibly shaken attendees exiting the funeral today for 6-year-old Noah Pozner, one of 20 children killed in the Connecticut school massacre last week, said they were touched by a story that summed up the first-grader best. His mother, Veronique, would often tell him how much she loved him and he'd respond: "Not as much as I [love] you," said a New York man who attended the funeral but was not a member of the family. Noah's family had been scheduled to greet the public before the funeral service began at 1 p.m. at the Abraham L. Green & Son Funeral Home in Fairfield, Conn. The burial was to follow at the B'nai Israel Cemetery in Monroe, Conn. Those present said they were in awe at the composure of Noah's mother. Rabbi Edgar Gluck, who attended the service, said the first person to speak was Noah's mother, who told mourners that her son's ambition when he grew up was to be either a director of a plant that makes tacos -- because that was his favorite food -- or to be a doctor. Outside the funeral home, a small memorial lay with a sign reading: "Our hearts are with you, Noah." A red rose was also left behind along with two teddy bears with white flowers and a blue toy car with a note saying "Noah, rest in peace." CLICK HERE for complete coverage of the tragedy at Sandy Hook. The funeral home was adorned with white balloons as members of the surrounding communities came also to pay their respects, which included a rabbi from Bridgeport. More than a dozen police officers were at the front of the funeral home, and an ambulance was on standby at a gas station at the corner. U.S. Sen. Richard Blumenthal, U.S. Rep. and Sen.-Elect Chris Murphy and Gov. Dannel P. Malloy, all of Connecticut, were in attendance, the Connecticut Post reported. Noah was an inquisitive boy who liked to figure out how things worked mechanically, The Associated Press reported. His twin sister, Arielle, was one of the students who survived when her teacher hid her class in the bathroom during the attack. CLICK HERE for a tribute to the shooting victims. The twins celebrated their sixth birthday last month. Noah's uncle Alexis Haller told the AP that he was "smart as a whip," gentle but with a rambunctious streak. He called his twin sister his best friend. "They were always playing together, they loved to do things together," Haller said. 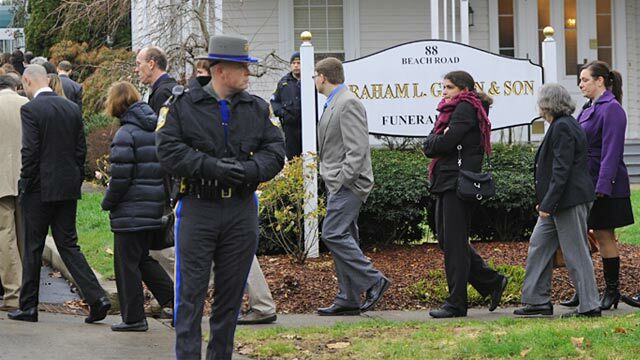 The funeral for Jack Pinto, 6, was also held today, at the Honan Funeral Home in Newtown. He was to be buried at Newtown Village Cemetery. Jack's family said he loved football, skiing, wrestling and reading, and he also loved his school. Friends from his wrestling team attended his funeral today in their uniforms. One mourner said the message during the service was: "You're secure now. The worst is over." Family members say they are not dwelling on his death, but instead on the gift of his life that they will cherish. The family released a statement, saying, Jack was an "inspiration to all those who knew him." "He had a wide smile that would simply light up the room and while we are all uncertain as to how we will ever cope without him, we choose to remember and celebrate his life," the statement said. "Not dwelling on the loss but instead on the gift that we were given and will forever cherish in our hearts forever." Jack and Noah were two of 20 children killed Friday morning at Sandy Hook Elementary School in Newtown, Conn., when 20-year-old Adam Lanza sprayed two first-grade classrooms with bullets that also killed six adults. Officials said today that the school, where the shooting took place, would be closed "indefinitely." Officials in Newtown, Conn., say they plan to reopen other schools Tuesday in an effort to get kids back to normal routines. Jack Pinto was a huge New York Giants fan, and his favorite player was wide receiver Victor Cruz. After hearing that Jack was a fan, Cruz wrote "R.I.P. Jack Pinto," "Jack Pinto, my hero" and "This one is 4 U!" on his cleats and gloves before playing the Atlanta Falcons Sunday afternoon. Cruz tweeted photos of his tribute shortly before the game, along with his condolences. Cruz told reporters he spoke to the family Saturday after hearing Jack was a Giants fan. Cruz was told the family planned to bury Jack in Cruz's No. 80 Giants jersey. More funerals for the shooting victims are planned for later this week. Jessica Rekos, 6, will be buried Tuesday at St. Rose Cemetery after a service at St. Rose of Lima Catholic Church.